Baking cakes and cookies is a very rewarding experience, but decorating them will make the experience more enjoyable and memorable. Decorating cakes and cookies is a great activity because it lets out all your creative juices and put them on these little heavenly foods. That being said, you might think you need to take a cake decorating class in order to make great decorations on cakes and cookies. Well, thanks to a new tool called the Kopykake Projector (available at Madison Art), you can set that expensive class aside and skip to the real experience. An innovative cake decorating tool, KopyKake Projector is a kitchen gadget that is sort of a spin off of projectors used in presenting slides and watching movies. This projector has a mirror that reflects the image you put under the clamps, with a 200-300 watt bulb to shine the light on the image. Once the image is clamped and projected, you can put your cookie or cake on the platform such that the image is reflected on its top. This way, you can easily copy the image with greater accuracy. Is Using Kopykake Projector Cheating? Many people say that using the KopyKake Projector is cheating because you get to trace the letters or image you want to put on the cookie or cake. However, this is definitely false. A tool can be used to cheat if it generates decorations on its own. However, using the KopyKake Projector takes a fair amount of skill because it’s still you who’s going to put the decorations. The KopyKake Projector will just guide you to copy the image accurately, especially if you have to decorate lots of cookies and cakes and/or you’re not yet very skilled at cake decorating to do it with a projecting tool like this. How Do I Use the KopyKake Projector? The first step is to choose the image that you will use. The image could be anything from words with particular fonts, patterns, cliparts, photographs, stickers, cartoons, or just about anything you can think of. The rule is that the image should be clear enough to be projected well by the tool. 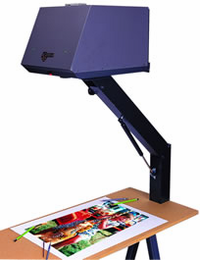 For greater accuracy and easier tracing, choose an image that has a dark outline. After selecting an image on the computer, resize it as close as the size of the surface of the cake or cookie. When printing an image, it’s best to print it on a printer-friendly semi-transparent paper which you can find at school supplies shops. If you can’t find this special kind of paper, a thin typewriting paper will do. After preparing the image, open the cover and clip the image under the two clamps. Then, close the cover, plug in the projector and turn it on. The image should be projected on the platform. Place the cake or cookie on the platform. Adjust the lens by moving it up and down to properly position the image over the surface. Once the image is ready, open the cover and clamp the image inside. It needs to be placed upside down so that it will project right side up. Start outlining the image through piping, then do the filling according to the colors of the image.